WANG Junjiang, ZHOU Tianyu, ZHANG Yang, LIU Mingxin. Expression and Action Mechanism of miR-98 in Colon Cancer Tissues[J]. Journal of China Medical University, 2018, 47(1): 9-12. Abstract: Objective To investigate the expression and action mechanism of miR-98 in colon cancer tissues.Methods Tumor tissues and adjacent tissues were collected from 40 patients with colorectal cancer. The expression of miR-98 in tumor tissues and adjacent tissues was detected by real-time PCR. miR-98 was overexpressed or silenced in cells, and the effects on proliferation, cell cycle, and apoptosis were analyzed using MTT, flow cytometry, and Hoechst 33258 assays.Results Real-time PCR showed that the expression of miR-98 in tumor tissues was lower than that in adjacent tissues (P=0.022). The survival rate of patients with lower miR-98 expression was shorter than that of patients with higher miR-98 expression. The MTT assay showed that miR-98 overexpression inhibited the proliferation of HCT116 cells. Hoechst 33258 staining showed that the overexpression of miR-98 could inhibit the cell cycle and promote the apoptosis of HCT116 cells.Conclusion miR-98 can inhibit the proliferation and promote the apoptosis of colon cancer cells. 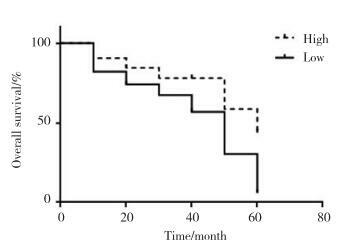 The expression of miR-98 is closely related to the survival of patients with colon cancer. WENDLER A, KELLER D, ALBRECHT C, et al. Involvement of let-7/miR-98 microRNAs in the regulation of progesterone receptor membrane component 1 expression in ovarian cancer cells[J]. Oncol Rep, 2011, 25(1): 273-279.